This new edition balances the theoretical and the practical for advanced undergraduates, those specialising in financial services at postgraduate level, individuals undertaking professional courses such as those offered by the IFS School of Finance, and employees working within the financial services sector. Ennew & Waite draw from global business cases in both B2B and B2C marketing, taking a unique approach in terms of structure by splitting discussion between marketing for acquisition and marketing for retention. A new companion website to support teaching, including PowerPoint slides, test bank questions, additional cases and cameo video mini-lectures. Financial Services Marketing 2e will help the student and the practitioner to develop a firm grounding in the fundamentals of financial services strategy, customer acquisition and customer development. 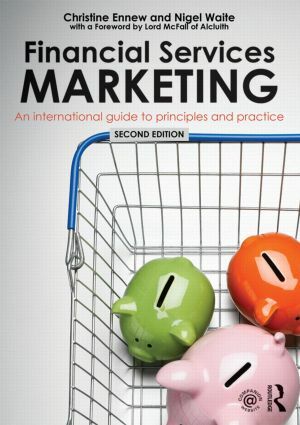 Reflecting the realities of financial services marketing in an increasingly complex sector, it provides the most up-to-date, international and practical guide to the subject available.